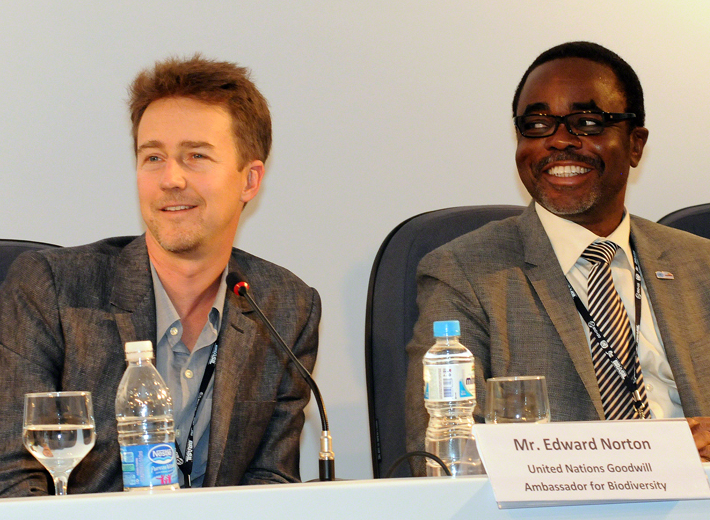 (Rio Conventions Pavilion) – The heads of the secretariats of the Convention on Biological Diversity (CBD), the United Nations Convention to Combat Desertification (UNCCD) and the United Nations Framework Convention on Climate Change (UNFCCC) reaffirmed their determination to work to generate synergies in national implementation in support of sustainable development. In a joint statement issued today, the Executive Secretaries of the three Rio Conventions committed to tackle sustainable development challenges by focusing on prioritized cross-cutting themes. These include landscape and ecosystem-based approaches to adaptation, generating and sharing information on climate change impacts and vulnerability when considering biodiversity and land use and mainstreaming gender into activities related to the implementation of the conventions act. Luc Gnacadja, Executive Secretary of the UNCCD said: “Further commitment by the international community is needed to achieve The Future We Want. Going carbon neutral, becoming land degradation neutral and halting the loss of biodiversity are intertwined goals. Countries and governments should set sustainable development goals that take into account existing inter-linkages among the three pillars of sustainable development and that recognize the important goals and targets already agreed upon among the Rio Conventions." “The good news is at the grassroots level,” says Luc Gnacadja. 20 years on, has the world delivered on the UNCCD? Yes and no. Yes, because when you look at the convention there are a number of requirements and commitments. Developing country commitments were to establish action programmes to address desertification, avoiding and restoring degraded lands and mainstreaming this into national poverty alleviation and development. Developed country parties were to provide financial support and technology transfer for certain country parties to implement those national programmes. Most of the developing country parties affected by desertification have established their national action plan, so that aspect of the commitment has been made. But the failure is that plans will not go to the fields and roll back desertification, it takes implementation. Unfortunately developing countries in Africa, for instance, have not succeeded in reflecting desertification in their plans for poverty eradiation, food security or development. Because the issue of desertification is in ivory towers in the ministries in charge of it. Desertification is more than planting trees. Desertification is first and foremost avoiding the misuse of the land, such as inappropriate use of fertilizer, the use of some crops that are not appropriate for the land, or the type of tillage that denudes [land]. (IISD) -- On the sidelines to the UN Conference on Sustainable Development (UNCSD, or Rio+20), the UN Convention on Biological Diversity (CBD), the UN Framework Convention on Climate Change (UNFCCC) and the UN Convention to Combat Desertification (UNCCD) launched a joint brochure outlining gender mainstreaming in the three Conventions, and describing challenges and opportunities for synergistic action. The information brochure, titled "The Rio Conventions: Action on Gender," describes particular challenges faced by women in combating climate change and desertification, and in contributing to the conservation and sustainable use of biodiversity. The brochure emphasizes that women can be agents of change but that they must be able to participate in all levels of decision-making. (Sérgio de Mello IDN) - Among few good tidings from the United Nations Sustainable Development Summit (Rio+20) is that the heads of the secretariats of three Rio Conventions have pledged to generate synergies in support of sustainable development. The three Conventions emerged from the UN Conference on Environment and Development (UNCED), also known as the Earth Summit 20, years ago. 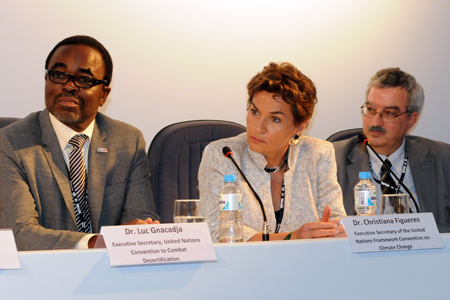 In a joint statement issued June 21, 2012, the Executive Secretaries of the Convention on Biological Diversity (CBD), the UN Convention to Combat Desertification (UNCCD) and the UN Framework Convention on Climate Change (UNFCCC) committed to tackle sustainable development challenges by focusing on prioritized cross-cutting themes. 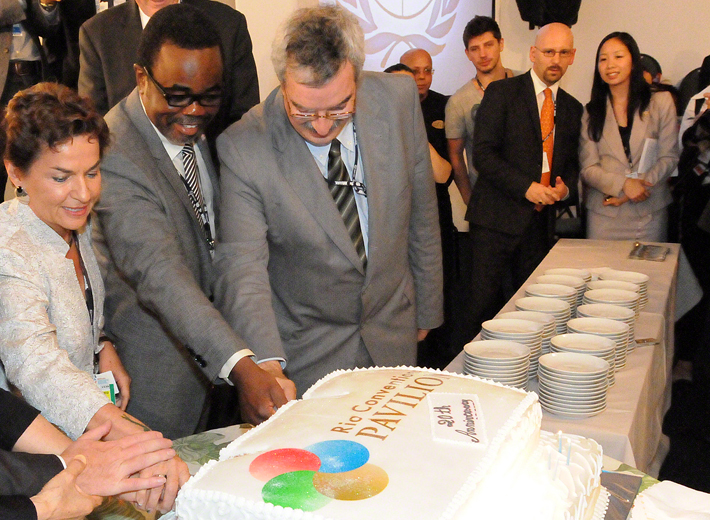 Among the three Rio Conventions, the UNCCD is of particular significance because, as the Convention's Executive Secretary Gnacadja pointed out during the global observance event of the 2012 World Day to Combat Desertification (WDCD) on June 17, there is "no life without soil and no soil without life". It was important to realise this because: "By 2030, the demand for food will increase by 50 percent, for water by 40 and for energy by 35 percent." Gnacadja was supported by several experts in the field: The UN Forum on Forests (UNFF) Director Jan McAlpine said: "Soil is like blood in our veins – without it nothing on the planet will survive." Nevertheless, each year globally 75 billion tons of non-renewable fertile soil is lost due to land degradation. Achieving zero net land degradation is feasible, said Dennis Garrity, Executive Board Member of the World Agroforestry Centre (ICRAF) and UNCCD Drylands. Ambassador. Garrity recommended the implementation of national and local regeneration measures and a transformation towards climate smart agriculture systems. Jochen Flasbarth, President of the German Federal Environment Agency, said that soil is inappropriately seen as a domestic issue and Alexander Mueller of the UN Food and Agricultural Organization (FAO) noted that soil degradation is not just a problem in developing countries. According to Mueller, the United States are losing fertile soil at a very high rate for example. (IISD) -- The Rio Conventions Pavilion at the UN Conference on Sustainable Development (UNCSD, or Rio+20) focused on the theme of Ecosystem-based Adaptation. Four panels addressed: ecosystem-based approaches to adaptation; economic valuation of land; the Bonn Challenges; and coastal climate change solutions. The panel on the Economic Valuation of Land considered the importance of valuing land. Panelists observed that deriving the full economic value of land is a prerequisite for sustainable land management and that many important ecosystem functions are not captured by the current returns on investment measures. On the way forward, panelists highlighted linking investors to producers, generating solid metrics to capture hidden values, and improving science-policy linkages.